It's been a tremendously busy time for me, and I've not been able to regularly monitor and manage the hives as much as I should have. The result was predictable: I had half my hives crash. The reasons weren't readily apparent. In one case it looks like they were chased out by a massive invasion of red ants. (Ants, both red and black, are probably my biggest problem in this locale; they cause me more work than even the varroa mites). A couple other hives simply look like they petered out. That may have been due to mites, or a failing queen that didn't get replaced, or even an ill-timed swarm. As I said, I was not able to keep a close eye on the hives since the honey harvest. I did selectively treat with Apiguard this fall, and it appears I only lost one hive that received treatment. 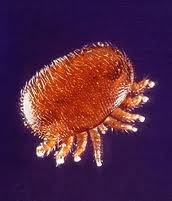 That seems to be a pretty good argument for total treatment next year, to try and keep a handle on the lovely varroa (see below). At this writing I have 4 strong hives, one fairly healthy hive, and one I just can't get a good read on. Due to our cold weather lately I've waited until mid-day, when the sun is on the hives, to inspect--- and that means the maximum number of foragers are away, so the population within the hives may appear deceptively low. At any rate, we had a pretty good fall flow of eucaplyptus, lavender, rosemary, and various wildflowers, so I haven't fed any hives yet, and their stores look good. That said, we've been getting some rain, so they'll eat those stores up pretty quickly. I'm planning on feeding all hives in January, to get them geared up for the ceonothus flow in late winter. If I can hit March with all 6 hives intact, I should have another excellent harvest. Plus, I will no doubt add at least another half-dozen hives through swarm captures, and if I get some March calls those swarmers could easily build up some harvestable reserves by August.